Chicken Marinade: in a medium bowl, combine garlic, lemon juice, red wine vinegar, olive oil, yogurt, oregano, and salt and pepper to taste. Whisk together until mixed well. Add the chicken pieces to the bowl and mix well to coat. Cover and refrigerate for at least 30 minutes. Tzatziki Sauce: using a micro-plane, grate cucumber into several paper towels. Squeeze remaining liquid from shredded cucumber. Combine drained cucumber, yogurt, garlic, white wine vinegar, salt and pepper to taste, and lemon juice. Refrigerate for at least 30 minutes. I recommend an hour. Grill chicken over medium heat, about 5 minutes per side. 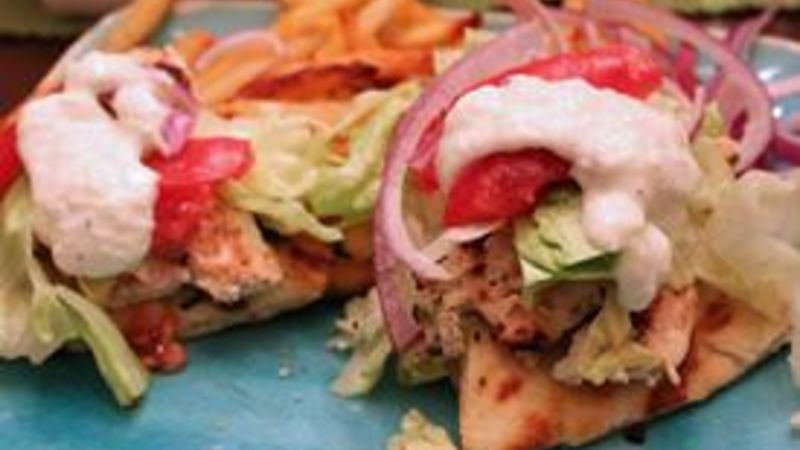 Once chicken is cooked, assemble gyros using warm flat bread, lettuce, tomato, red onion, and Tzatziki sauce. Serve immediately.